Have you noticed the ever-increasing speed of time? The ceaseless barrage of activity, of information, of news that seems to spiral from us and around us at a faster rate than it did ten years ago? Do you feel overwhelmed by the demands that you place on yourself, trying to keep up with your desires to be more, do more, be better? This is the sentiment of our time, and it is felt by all, even those of us who try to consciously avoid the pitfalls of mainstream capitalism and consumerism. There is no way to participate in society without absorbing the collective anxiety that we are all co-creating. But there are ways to resist being overcome by the madness. Yoga, meditation, positive thinking, play, good food, soulful music, gardening–all can help to ground us and brighten our days. And the plant kingdom is full of allies for helping to bring us back to center: ashwagandha, milky oats, blue vervain, rose, hawthorn, devil’s club, motherwort, too many to name. The one that I want to share about today is Reishi. This is an herb that we should all know. Red-orange, fiery fungus, primordial mushroom of the forest, tapped into the matrix of the underworld, full of ancient wisdom, Reishi is well known as a tonic herb from the Chinese medical tradition. Highly revered for centuries, reishi has a long history of use as a longevity tonic with immune-modulating properties. Today ancient and modern science convalesce to create a three-dimensional understanding of this plant, and its applications are myriad. We know reishi to be an energy tonic that specifically supports the vital energy of the physical heart and the spirit or the “shen” that resides in the heart. It has been shown to stabilize blood pressure, lower cholesterol and to protect and revitalize the liver. Research has shown reishi to be effective in protecting the liver from the toxic effects of chemotherapy and reduce the likelihood of metastasis. As an immune modulator, reishi strengthens the immune system without stimulating it. In fact, it has the ability to calm down a hyperactive immune response (i.e. allergies or autoimmune conditions) or to activate an immune response depending on what the body needs. The list goes on and on. It truly has an application for every body system, and is generally safe for almost anyone to use daily. An adaptogenic herb by definition is one that is non-toxic and produces a non-specific response, meaning that it is a tonic in the truest sense. It is nourishes and restores balance to the system. It also supports the body in its intelligence to make use of it as it sees fit rather than eliciting a strong action in one direction or another, which usually results in some kind of side effect. Reishi is all about balance. And context. At first glance, its bright orange color and rigid structure suggest that it embodies the fiery and active energy of yang. And it does, to an extent, represent the fire element. Yet it cannot grow without the soft, moist, mossy surroundings of the forest, representing the yin, the water and earth elements. 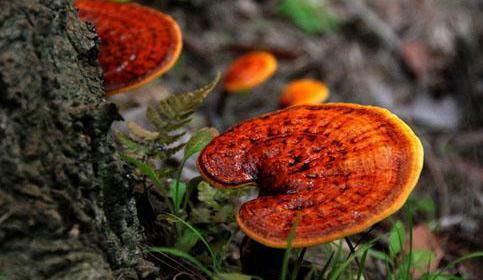 (Well, technically it can be cultivated, but wild reishi is considered to be stronger medicine). My experience with reishi is marked by a feeling of groundedness, of earth, of support, without the feeling of heaviness that the earth element carries. It gently restores fire to the system without creating excess heat . 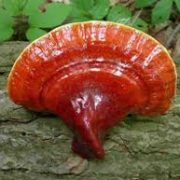 Reishi’s reputation for calming the mind and the spirit makes it a wonderful ally for anyone experiencing emotional shock, PTSD, or living in a state of chronic stress with the sympathetic nervous system (yang) in overdrive. It will help you to get into the more nourishing and replenishing parasympathetic mode (yin). It seems to contain every element and plant and mineral of the forest ecosystem in its fruiting body and to nurture both yin and yang. It works best when used in the context of lifestyle change, meaning that it will help with adrenal burnout as long as you also pause, make space, slow down and give the body time to recharge. If you don’t change your lifestyle, you are only putting a band-aid on a wound and is a waste of a precious resource such as reishi. In the wake of Summer Solstice, when the yang energy of productivity is at its peak, we can all take reprieve from the heat in the shade of the metaphorical forest contained in the form of reishi mushroom. Summer can be a time of intense heat and energy and activity. It can also be a time marked by socialization, lazy days, cook outs, camp outs and vacations. Heat can be both relaxing and stimulating, depending on the degree of heat, and the context. It’s all relative. It’s all up to us as individuals to find a rhythm, a system, an intentional state of dis-order, whatever we need to do to feel our way to center, over and over again, multiple times a day. Remember to breathe deep and that we are all ultimately more strong, productive and useful when we are able to approach the chaotic events of modern life from a place of calm & center. Blue Vervain is a wonderfully relaxing plant with many uses. Native to the United States, Vervain is a beautiful perennial herb, growing 3-8′ tall. It prefers full sun and medium-wet soils. 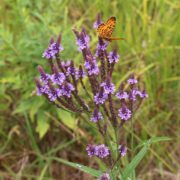 Often found in wet meadows and river bottoms in the Great Lakes region, Blue Vervain attracts butterflies and other pollinators and makes a great addition to your medicinal herb garden. Uses: a strongly relaxing nervine, vervain calms states of anxiety as well as hysteria and seizure. It is useful for occasions (or periods of time) when the sympathetic nervous system is stuck in overdrive, such as acute and chronic stress, or when body is shivering due to a fever. In fevers, the diaphoretic action of vervain opens the peripheral blood vessels to bring on a sweat and break a fever. It can also be useful following a debilitating illness to restore digestion and tone. As a bitter tonic, small doses of vervain are stimulating to digestive secretions, and decongestant to the liver and gallbladder. Vervain also has a reputation for helping to relieve hot flashes and night sweats. Indications: hot flashes, night sweats, fevers, and any time the pores are tightly closed and the body needs to vent. Constitutionally speaking, vervain is suited to people who are intensely driven with perfectionist tendencies. These people often have very high and unreasonable expectations of themselves as well as others. Their strong mental and emotional focus draws energy away from the digestive and reproductive centers. And without that grounding lower body strength, they often overexert their upper bodies, resulting in tension in the upper shoulders and neck. Matthew Wood writes that vervain is for people with “strong above, weak below.” He also recommends it for women who have intense food cravings during menses (Earthwise Herbal: A Complete Guide to New World Medicinal Plants p.351). Dosage: As a tincture, use 2-4 ml per day according to the British Pharmacopeia. Matthew Wood recommends 1-3 drops 1-3 times a day. Contraindications: not recommended during pregnancy. It is not a nourishing or tonic herb so prolonged use and/or high doses are not recommended.